This note describes how medical information about you may be used and disclosed and how you can get access to this information. Please review it carefully. The East Windsor Ambulance Association is required by law to maintain the privacy of certain confidential health care information, known as Protected Health Information or PHI, and to provide you with a notice of our legal duties and privacy practices with respect to your PHI. The East Windsor Ambulance Association is also required to abide by the terms of the version of this notice currently in effect. For treatment: This includes such things as obtaining verbal and written information about your medical condition and treatment from you as well as from others, such as doctors and nurses who give orders to allow us to provide treatment to you. We may give your PHI to other healthcare providers involved in your treatment and may transfer your PHI via radio or telephone to the hospital dispatch center. For healthcare operations: This includes quality assurance activities, licensing, and training program to ensure that our personnel meet our standards of care and follow established policies and procedures, as well as certain other management functions. Reminders for Scheduled Transports and Information on Other Services: We may also contact you to provide information about other services we provide. The right to access, copy or inspect your PHI: This means you may inspect and copy most of the medical information about you that we maintain. We will normally provide you with access to this information within 30 days of your request. We may also charge you a reasonable fee for you to copy any medical information that you have the right to access. In limited circumstances, we may deny you access to your medical information, and you may appeal certain types of denials. We have available forms to request access to your PHI and will provide a written response if we deny you access and let you know your appeal rights. You also have the right to receive confidential communications of your PHI. If you wish to inspect and copy your medical information, you should contact our privacy officer. The right to amend your PHI: You have the right to ask us to amend written medical information that we may have about you. We will generally amend your medical information within 60 days of your request and will notify you when we have amended the information. We are permitted by law to deny your request to amend your medical information only in certain circumstances, like when we believe the information you have asked us to amend is incorrect. If you wish to request that we amend the medical information that we have about you, you should contact our privacy officer. The right to request that we restrict the uses and disclosures of your PHI: You have the right to request that we restrict how we use and disclose your medical information that we have about you. The East Windsor Ambulance Association is not required to agree to any restrictions you request, but any restrictions agreed to by the East Windsor Ambulance Association in writing are binding on the East Windsor Ambulance Association. Internet, Electronic Mail, and the Right to Obtain Copy of Paper Notice on Request: If we maintain a website, we will prominently post a copy of this Notice on our website. If you allow us, we will forward you this Notice by electronic mail instead of on paper and you may always request a paper copy of the Notice. 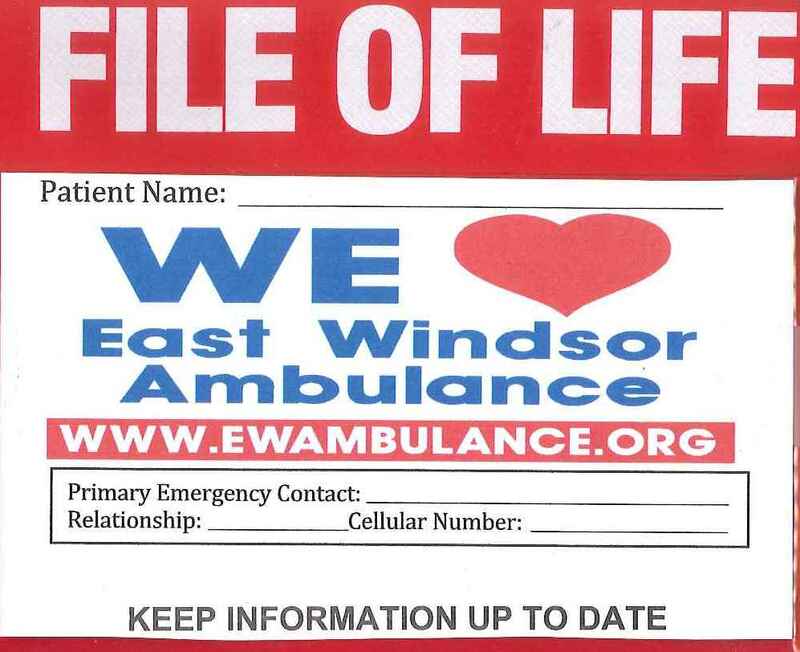 Revisions to the Notice: The East Windsor Ambulance Association reserves the right to change the terms of this Notice at any time, and the changes will be effective immediately and will apply to all protected health information that we maintain. Any material changes to the Notice will be promptly posted in our facilities and posted to our website if we maintain one. You can get a copy of the latest version of this Notice by contacting our privacy officer. Your Legal Rights and Complaints: You also have the right to complain to us, or the Secretary of the United States Department of Health and Human Services if you believe your privacy rights have been violated. You will not be retaliated against in any way for filing a complaint with us or to the government. Should you have any questions, comments or complaints, you may direct all inquiries to our privacy officer.